Landon just turned 4 months old!!! I can't believe how fast the last few months has gone by! 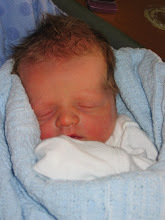 He's definately not a newborn anymore, and it makes me a little sad :(! He is a super happy baby pretty much all the time and we just can't seem to get enough of him! He is smiling, giggling, rolling over, and discovering new things every day! He officially weighs 15.5 pounds and is 25.5 inches long! He's our little chubba bug! He loves to sit in his bumbo, eat rice cereal, and one of his favorite times of the day is when his daddy gets home :)! He gets a huge grin from ear to ear when he hears his dad's voice! Our little Kohen has grown up so much since we brought his little "brudder" home! His vocabulary went from about 100 words to saying just about everything in the last 2 months! He comes up with some pretty funny stuff sometimes! He'll open up the fridge and stand there with his hands on his hips and say "hmm...". When Landon starts crying he says "Oh Landon, please stop crying baby brudder!". And of course now that I am trying to think of all the funny things he says, I can't come up with anything :)! But he can come up with some pretty funny stuff! He is obsessed with helmets, or as he would say, "pelmet", both of his grandpa's, and of course his baby brudder!